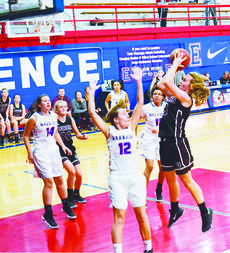 Baileigh Young stops a fast-break against Eminence in the Lady Rebels season opener at Eminence Nov. 28. Haley Young gets the easy lay-up on a fast-break by the Lady Rebels. Destinee Epperson goes up strong and scores the bucket. Opening week proved to be a solid start for the Lady Rebels as they picked up a pair of wins to begin the season. The team stepped on the hardwood in Eminence Nov. 28, for game one, shooting 54 percent from the field. 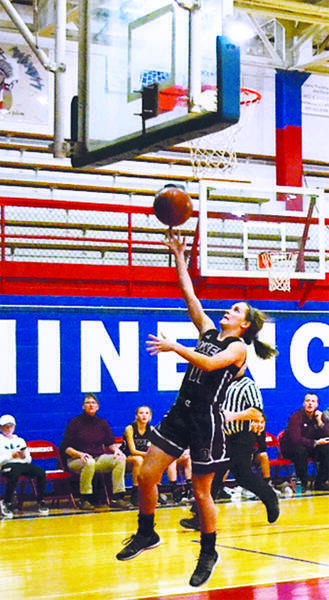 An error in Eminence’s book resulted in the Lady Rebels shooting two technical free throws to start the game. Freshman Lexie Moore put her team on top going one for two from the line. By the end of the first quarter, the Lady Rebels had secured a 15-point lead, outscoring the Warriors 20-5. Holding the Warriors to just six points in the second quarter, the Lady Rebels led at the half 37-11. 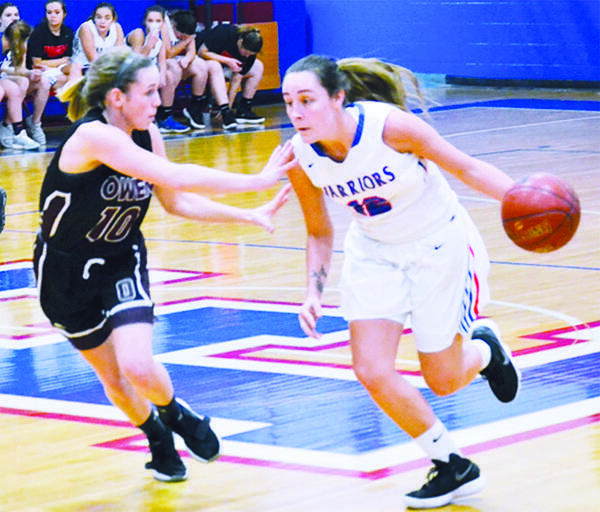 Though the Warriors made some halftime adjustments, they had no answer for the Lady Rebel’s offensive power and strong defensive ball pressure. Finishing strong in their opening game, the Lady Rebels beat the Warriors 74-30 with four players scoring in the double digits. Senior Haley Young led scoring with 16 points. Senior Destinee Epperson pulled down nine rebounds and finished with 15 points. Eighth-grader Gracie Ferguson and Moore finished tough, Ferguson with 13 points and Moore with 12 points. Head coach Amy Wesselman was pleased with the team’s effort against Eminence. Game two of opening week proved to be a greater challenge for the Lady Rebels as their shooting percentage fell to just 39 percent from the field against the Bellevue Tigers. Epperson won the tip and started scoring efforts with a bucket early in the game. 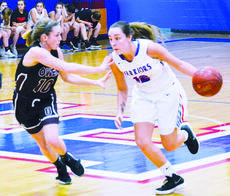 It proved to be difficult for either team to find their groove, mustering just 17 points between them with the Lady Rebels leading 9-8 at the end of the first quarter. At the half, the Lady Rebels went to the locker room with a two-possession lead, outscoring the Tigers 19-15. The Lady Rebels continued to struggle offensively into the second half but managed to outscore the Tigers 25-16 in the second half of play. A strong defensive effort kept the Tigers trailing. Team fouls became a factor late in the third quarter with four of the five starters on the bench nursing three fouls. Despite their offensive struggles, the Lady Rebels pulled out the victory, defeating the Tigers 44-31. Epperson led scoring with 15 points, followed by Moore with 12 points. Woodyard pulled down seven rebounds and finished with six points. The Lady Rebels were back in action this week with three home games. The team played Williamstown Dec. 3 and will face South Oldham at 6:30 p.m., today, Wednesday, Dec. 5. Tip-off is set for 7 p.m. The team will wrap up the week as they step on the hardwood against Carroll County at 6:30 p.m., Friday, Dec. 7.